Message: I bought a pair of white cotton bib overalls and dyed them tan with rit dye according to directions. The tan set, then I sprayed them with dark green, dark brown, and black from spray bottle to camoflauge them. When I washed them, all but the tan washed out. What happened? This is pretty much what you would expect to happen. Rit All Purpose Dye is meant to be applied by boiling the garment in the dye in a big pot for an hour. Warm water is not as good for Rit as extremely hot water, but it will work to some extent, as you saw with your tan dye. It will not work at all well when simply sprayed on the garment at room temperature. What you need is a better type of dye. Fiber reactive dyes, such as Procion MX dye, can be applied directly, by spraying them on. These are the dyes that are popular for tie-dyeing, because they work so much better than all-purpose dyes. Instead of being set with high heat, they are set with washing soda or soda ash, a common laundry chemical. There are many advantages to using Procion MX dye instead of Rit dye. The dye is far more permanent, and won’t run in the laundry to ruin other clothing like Rit dye does. You don’t have to ruin a cooking pot by using dye in it (you should not plan to reuse a dyeing pot for food). You have many more options for how to apply the dye. It even tends to cost less, since Rit dye is packaged with a lot of salt and detergent in little boxes that will dye only up to one pound of clothing each. To use the Procion dye for your camouflage project, first soak your cotton overalls in a gallon of water in which you have dissolved one cup of soda ash, then remove them from the water, squeezing out as much of the excess liquid as you can, and spread the overalls out on a waterproof surface. Dissolve Procion MX dye in water, using about four teaspoons of dye powder per cup of water for dark colors. Wear a dust mask while working with the dry dye, so you don’t breathe any of the dye dust, because it can cause allergies. you can apply the dye (wearing waterproof gloves) by dribbling it onto the fabric with a pointy-tipped squirt bottle, or by dipping a sponge in it and applying it to the fabric, or by placing the dye mixture into spray bottles and spraying (wear a dust mask so you don’t accidentally breathe any dye mist). Keeping in mind that the dye will be lighter in color after you wash out the excess, be sure to apply enough dye to make the garment much darker than you want. The wet dyed items then need to remain damp overnight in a warm place, 70 degrees Fahrenheit or warmer. If you live in a dry climate, you’ll need to do something to keep the overalls moist while the dye reacts overnight. You can place them inside a plastic bin with the lid on—a camouflage pattern will probably not be spoiled by having wet dye from one part of the garment bleed onto another part where they come into contact—or you can wrap them in plastic wrap, or, instead, you can mix urea into your dye mixture, because urea in the mixture attracts moisture and helps keep the garment damp enough for a long time, even if it feels pretty dry. After you’ve left the dye to react, the next day (or a day after that, if it’s more convenient), you should wash the overalls once in cool water to remove the soda ash and the largest part of the unused dye, than wash it twice in the hottest water you can to remove the rest of the excess unattached dye. It’s best to turn up the water heater to 140 degrees Fahrenheit for this washing out step, but if you use cooler water you just have to take more care to wash the garment separately the first few times, since there will be some excess dye that can transfer onto other clothing if it is left lying around damp at some point in the wash. Of course the original tan Rit dye is apt to run when wet, and it will tend to wash completely out after a while. If all of your tan dye washes out, you will want to get some tan Procion dye to replace it with. Where can you buy Procion MX dyes? 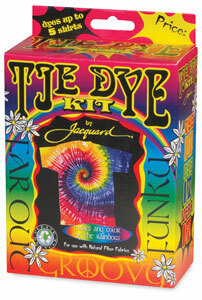 Most people who do a lot of dyeing buy their dye by mail-order from dye suppliers such as Dharma Trading Company, which also sells soda ash and urea, but you can buy Procion dye from many different sources in the form of a tie-dye kit. Jacquard Products (a dye manufacturer) makes this especially easy for your project by producing a Camo Tie Dye kit, which you can buy from many different art and crafts suppliers, or from Amazon, or even, depending on the time of the year, from stores such as Walmart. It contains premixed dye powders in olive, black, and bronze. This entry was posted in all purpose dye, dye painting, Procion MX dye on February 10, 2015 by pburch.